Packing on the pounds is a Thanksgiving tradition for most of us, but it can be very dangerous for our pets. A diet high in fat can be extremely harmful to your pet's health, and even though it's only once a year, the change in diet can not only lead to obesity but some digestive issues. Feed your pet his normal pet food and refrain from over indulging him with table scraps! Watch the table! Whether you have a little jumper or a long legged love bug, an unsupervised table of food can be more then just eye candy to your pets. Keep food covered and away from table edges. 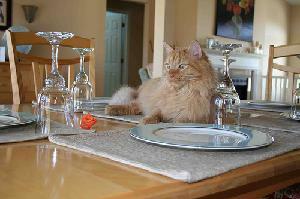 An easier solution might also be to keep the animal out of the dining room during dinner time. This can also help curb the urge to feed them Thanksgiving treats! Keep your trash cans out of reach of your pets, or better yet, take it out right after your done with it. This will ensure that your animals donâ€™t jump inside the canister or knock it over. Even a vegetarian house wants to keep an eye out, because onions and chocolate can do just as much damage! Don't give your pets animal bones! They are hollow and break and splinter easily. Also, because they are so easily broken, dogs usually won't chew them thoroughly. The results are sharp pieces that can choke the dog, block or tear the intestines. Keep your pet calm and unstressed while people are visiting. Many houses are filled with running children, the chatter of relatives, and a football game in the background. 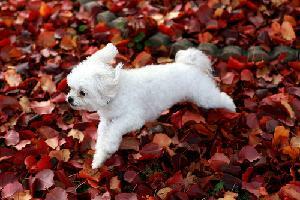 Though cheerful for people, pets can get overwhelmed from these sounds and events. To ensure that your pets have a great time too, consider giving them their own space away from people, feed them out of reach of children, strangers or loud noises, and take them for a nice long walk before guests arrive to help spend their energy. Watch out for your four-legged friends while cooking. Sometimes a little kitten under foot can create a disaster when carrying a large bowl of gravy. Keep all your pets out of the kitchen and away from the hustle and bustle. Also, watch around open oven doors. Leave your pets at home when attending holiday parades and festivities. Though floats, large balloons and crowds can be a blast for your family, they can send your dog into an anxious or even aggressive state. Leave your dog at home and let them enjoy the festivities on TV while relaxing on their favorite blanket. As always, make sure your pets are wearing their collars with tags. In case someone forgets to shut the door, you want to make sure your pets are easily identifiable.